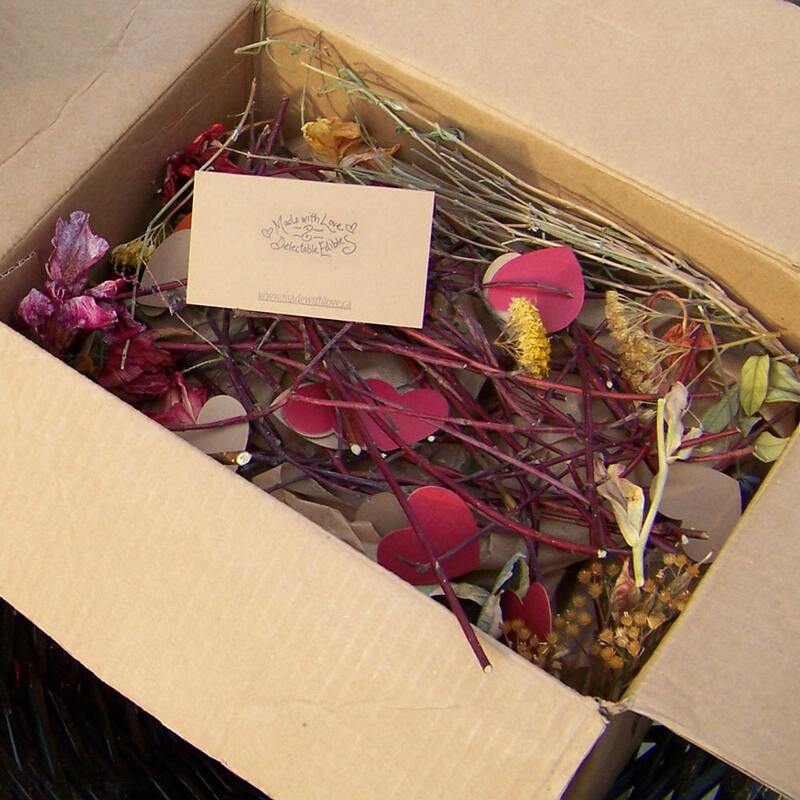 This beautiful artisan gourmet foodie gift contains a set of 6 Magic Meal Mixes as pictured, each individually nestled in our signature eco gift box with flower petal stuffing, kraft tissue, hearts, leaves, dried flowers, twigs, herbs & love! Cashew Curry Roasted Oven Dinner Mix, Rosemary Focaccia Magic pizza or Artisan Bread Mix, and 4 different Hearty Soup Mixes to nourish and delight you at the dinner table. 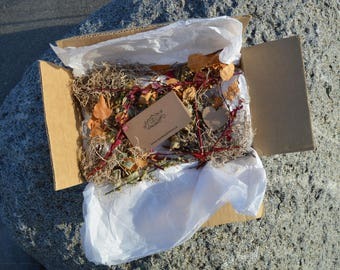 A conscious, ethical green gift, this package evokes memories of an old country store in an english garden filled with love. Just add your personal message with your purchase and we will enclose a handwritten note card. A Perfect Birthday, Anniversary or Housewarming gift. Make their lives easy with deliciously healthy gourmet meal mixes to make dinner times a breeze! Each Magic Meal DIY Soup Mix makes two huge big bowl servings or six 1 cup servings of healthy gourmet meals just like magic. Just add water/milk, oil/butter & a couple fresh ingredients for relaxing eco gourmet whole food meals, made with love in your own kitchen. 5 minutes or less prep plus 15-60 mins cook time. Step by step recipe directions on every package. 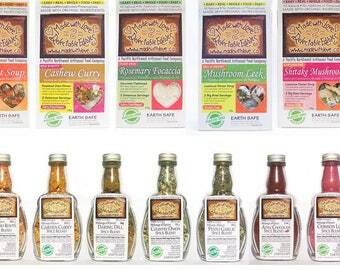 6 Vegetarian DIY Magic Meal Mix options are included in this kit. All flavours can be made with organic meat or chicken and/or strictly vegetarian fresh veggie add-ins as desired. Each plastic-free, compostable cello bag is hand filled with six different handcrafted artisan blends of 100% natural and organic grains, seeds, nuts, lentils, veggies, herbs and spices. Simple whole food pantry staples with home made heartwarming real whole foods, a twist of fusion fare & earth trekking adventure... feed yourself and your loved ones very well, while simultaneously nourishing self with calm simplicity and ease. A nourishing gift for the spirit and a real blessing from our earth. Eat Your Words Alphabet Soup Mix - Dried carrots, peppers, onions, potatoes, leeks, cabbage, tomatoes, celery, beet, spinach, Organic Red Lentils, herbs & spices, Organic whole grain & golden amber durum wheat semolina, turbinado sugar, natural sea salt. ( Vegan / Dairy-free ) * For Gourmet No Fuss One Dish Entertaining Add: Water, Butter, Chicken/ Tofu/ Shrimp and fresh cilantro. Earthen Fire Shitake Mushroom Soup Mix: Dried shitake and button mushrooms, green & white onions, Parmesan cheese, (Milk, salt, bacterial culture, rennet, calcium chloride) tapioca, herbs & spices, whole black, white, red and green peppercorns, unbleached raw turbinado sugar, dry mustard, natural sea salt. ( Gluten free ) * For Gourmet No Fuss One Dish Entertaining Add: Water, Butter, Cream, Scallops and Asparagus. Creamy Mushroom Leek Soup Mix: Dried mushrooms, leeks, onions, Parmesan cheese, (Milk, salt, bacterial culture, rennet, calcium chloride), tapioca, herbs & spices, unbleached raw turbinado sugar, natural sea salt. ( Gluten free ) * For Gourmet No Fuss One Dish Entertaining Add: Water, Butter, Cream, Organic Chicken &/or baby potatoes & corn.